Jonah Bank retail customers can deposit up to $3,000 in combined check value each business day, with a limit of 5 checks per business day. Jonah Bank commercial customers can deposit up to $30,000 in combined check value each business day, with a limit of 20 checks per business day. Higher limits are available upon request and are subject to review. Deposits are subject to verification and funds may not be available immediately. Once the deposit has been received, you will be able to view the pending transaction in the App. Deposits received by 4:00 p.m., M.S.T., on business days will post during overnight processing and are usually available in your account the next business day. Deposits received after 4:00 p.m., M.S.T., or on a non-business day (Saturday, Sunday or federal holiday) will be reviewed the following business day, posted during overnight processing and available within two business days. How do I endorse a check? 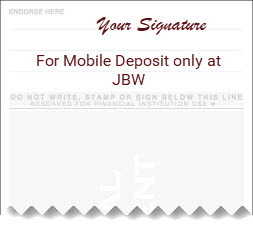 "For Mobile Deposit Only at JBW"
Please remember to do this before you take a picture of your check. You may check the status of your deposit through the Mobile App under “Mobile Deposit” by selecting “Deposit Check” and tapping on "More". Alternatively, you can view the status of submitted checks in the "Activity Center" located under the "Transactions" menu option. Once the check has been reviewed by the bank, the status will change from “Submitted” to “Accepted.” In addition, you will receive an alert to your registered email account when a mobile deposit has been submitted and subsequently when the deposit is approved and/or rejected. Jonah Bank reserves the right to reject any deposit made through Mobile Deposit. You will be notified if your deposit has been rejected. What should I do with my check after mobile deposit is complete? Confirm the deposit is listed as “Accepted” within the Mobile App and the funds have been deposited to your account before destroying the check. Other than your endorsement, do not write on your check until after the deposit has been posted to your account. We recommend that you retain your paper check for 60 days after the deposit. After this time, your paper check should be destroyed. Are there any tips for depositing checks? For help with Mobile Deposit you can contact us by phone or by email with your questions, we are always here to help.